School Library Journal - 01/01/2018 PreS-Gr 1—Selznick and Serlin take the easy reader format to new creative heights. Baby Monkey may be a baby (and a monkey) but he has a full-time job as a private eye. 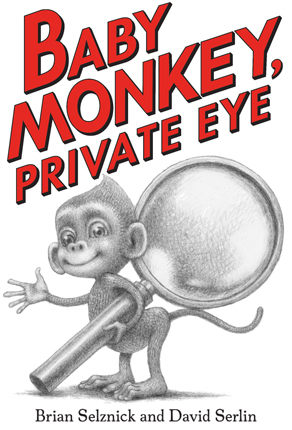 Baby Monkey solves five cases (one for each chapter) by looking carefully for visual clues. Full-page illustrations facing single, simple, and often repetitive sentences in an oversized typeface make this ideal for emerging readers. The sharp pacing and charming humor also make it an excellent read-aloud choice. Selznick's signature black-and-white drawings—his noir-like style here played up to full effect—invite readers to linger and look carefully. With each case, the framed paintings and various bric-a-brac decorating Baby Monkey's well-appointed office changes. Hidden clues and jokes abound, as in "The Case of the Missing Spaceship," wherein the opening two-page spread shows a framed poster of A Trip to the Moon (a hat tip to devoted Selznick fans), an image of Apollo 13, a portrait of Galileo Galilei, and a bust of John F. Kennedy. Will most of these references sail over the heads of the intended audience? Perhaps. But the story works just as well without them, and Selznick and Serlin take pains to make sure young readers have enough information to look them up if they are so inclined; the "Key to Baby Monkey's Office" in the back matter lists each visual reference by chapter/case. 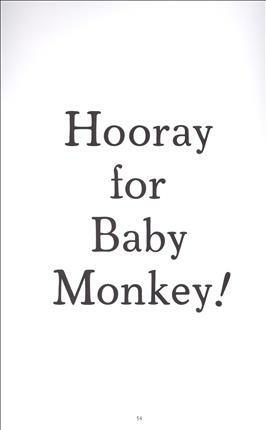 A running gag about Baby Monkey forgetting to wear—and struggling to put on—pants will have readers cracking up. In the very last case, the primate private eye jumps into the loving arms of his mom and takes a well-earned nap. VERDICT A delightful easy reader that is as funny as it is elegant. This will be enjoyed equally by youngsters and their grown-ups.—Kiera Parrott, School Library Journal - Copyright 2018 Publishers Weekly, Library Journal and/or School Library Journal used with permission.